Biwar is a handsome and gallant of Mimika, Papua , Indonesia . When he was still in the womb , his father was killed by a dragon attacked while wading through a river in the area Tamanipia . Therefore , since birth he was treated and educated by his mother alone and comes with a variety of knowledge . 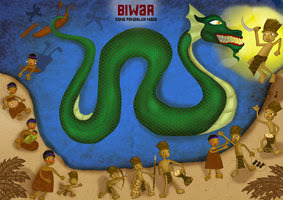 As an adult , Biwar intends to destroy the dragon that has eliminated his father's life . How do Biwar destroy the vicious dragon ? Follow the story in Dragon Conqueror Biwar story below ! Once, in Mimika , Papua , there is a village inhabited by ethnic group of Mimika . Livelihoods are memangkur sago which have been inherited by generations of their ancestors . Every day , both men and women , memangkur sago along the river in that area . One day , some of the villagers were about to find sago by boat . In addition to carrying a hatchet and pickaxe tool , they also carry supplies such as food and beverages such as sago memangkur activity will take approximately two to three days . After a long sail the river , they arrived at a place that a lot of sago trees . Eagerly , the men began to cut down trees that can be taken sago starch sari . After the fall , they stripped it of sago tree to get to the heart of sago in it . Then their hearts from the tree until it resembles mashed coconut pulp using a pickaxe . Collisions result is what is called the sago . Furthermore , the sago they collect in a container bamboo that have been split , and interfere with water . After that , the women immediately squeeze the sago . This juice containing sago starch . To get the quintessence , the juice they let some time to extract the starch settle to the bottom of the container bamboo . After the juice turns from white to clear , clear water that they pass to the left is the core sediment sago . The sago core then they shape like a tennis ball or elongated like a rice cake . Furthermore , sago - ready cooked sago is they put in a container called Tumang , the baskets are made of rattan . After raising all Tumang containing sago into the boat , the group was sailing down the river to get back to the township . When the boat they were traveling through the river in the area Tamanapia , seeokar dragon suddenly emerges from the water and immediately attacked them . Only once kibas , dragon tail boat capable of destroying it to pieces . No doubt , all passengers thrown and drowned in the river , except for a woman who is pregnant can save themselves . Incidentally pregnant women able to grab one of the pieces of the boat that was destroyed when he was thrown into the river . Pieces of boat that was later made ​​as a buoy until he can get to the river bank and fled into the woods . To shelter from wild animals , the pregnant woman living in a cave that he found in the forest . In the pregnant state , the poor woman was trying to find the young leaves and roots to survive . One day , she painstakingly struggled birth alone . On the authority of God , she delivered a baby boy a handsome and gave the name Biwar . Now , she is no longer lonely stay in the middle of the forest . He was caring and raising Biwar lovingly . When Biwar grows into a teenager, he taught a variety of science as a way of archery , trapping , and make a fire . In addition , he also taught Biwar play drums until adept at playing the instrument . Several years later , Biwar has grown into a handsome young man , strong , and brave . Every day she helps her mother find a side dish with fish in the river way . She also helped her mother make a simple house called honai , namely indigenous Papuans house made ​​of wood with a conical roof of straw or reeds .One day , Biwar just got back from fishing in the river with a few big fish . Arriving in front of his house , he put the fish catch was on the ground while screaming for his mother .
" Mama ... , Mama ... , get out look! Biwar carry a big fish , " shouted Biwar .Heard his cry , his mother was out of the house as she asked , "Where did you get the fish , my son ? "" That Biwar fishing in a river in . The river was a lot of fish and the surrounding scenery is very beautiful , "said Biwar , " If Mama wanted to see it , tomorrow Biwar will show that place . "The mother accepted the invitation Biwar . The next day , they went to the river in question . Biwar mother was surprised when it arrived at the river . He immediately reminded of her late husband .
" Biwar , my son ! Behold , your father and his family and friends were killed in the river Mama park was attacked by a dragon ! "Said the mother recalled her past a very sad heart .Hear the sad story of her mother , Biwar determined to destroy the dragon . However , the mother stopped him.
" But , Biwar ! The dragon is very fierce , " his mother prevented ." Not Mama . Is not Mama has taught a variety of science Biwar ? With that science would destroy the dragon Biwar of killing Papa , "said Biwar . The mother is unable to stem Biwar hard determination . Before carrying out his determination , Biwar with her mother went home to prepare all the necessary weapons . After preparing spears , machetes and arrows , Biwar also said goodbye to his mother to go find the dragon nest along the river .
" Be careful , my son ! " His mom said ." Well , Mama , " said Biwar as he left his mother .Arriving at the edge of the river , Biwar saw a cave believed to be the dragon's hideout ." I'm sure the dragon was certainly hiding in the cave , " muttered Biwar . With the steps slowly , Biwar approached the cave . Arriving at the mouth of the cave , he immediately took tucked in his waist drums and blew it in order to lure the dragon out of the cave . The music played drums Biwar really attract the dragon. Not long after , there came a roar from inside the cave . Hear the voice, the more convinced Biwar that in that cave dragon nest . He was soon ready with a machete in his hand as a precaution in case the dragon came to attack him . Sure enough , not long ago , the head of the dragon suddenly appeared at the mouth of the cave . Without thinking , Biwar immediately threw his spear into the dragon 's head and managed to wound him . Although badly injured , it still looks ferocious dragon . So before the dragon attacked , immediately revoke Biwar machete tucked in his waist . "Take vengeance on the father and family that you've destroyed in the river ," cried Biwar while beheading the dragon to the breaking point . No doubt , the dragon fell limp in front of the mouth of the cave . Looking at it , quickly Biwar hoarding dragon body with rocks . After ensuring that the dragon really dead , he immediately went home to tell his success to his mother destroy the dragon . How glad the heart of the mother to hear the good news ." Dragon has received his punishment . Mama heart is relieved now , "said his mother , " Immediately make my boat and then we go back to the ghetto ! " The next day , Biwar also makes a pretty small boat carrying them both . Within a few days , the boat was completed and made ​​ready for use . Finally , with the boat , with his mother Biwar sail the river to the land of her birth . Arriving at the village , they were greeted with joy by the locals . To celebrate the success of Biwar as a hero who had conquered the dragon , they held a festive party .